Nostalgems, sponsor of CraftSanity episode 94, is hosting a contest on its Facebook page. Feeling a little low as the worldwide recession gets worse? 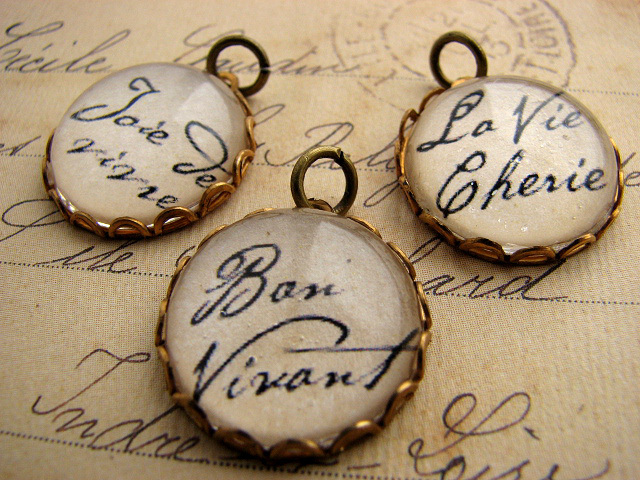 Well brush up on your Francais and keep your chin up with these uplifting French speaking dome pendants! Nostalgems has got seven (7) of these Dome Pendant Kits to give away. What you need to do is add yourself as a fan in our Facebook Page and simply comment there about how you are dealing with the credit crunch. We’ll choose 7 of the most creative and original answers! Contest will close on March 18, 2009! Note: Comment on the Facebook page, not here, to enter the contest.